Close your eyes and think about your favorite brands. What do you see, feel, hear, taste? How quickly did you conjure these images? Most likely it was instantaneous and this is attributed to BRANDING! Think of yourself a marketer. Branding is the chief goal of marketers for to define purpose, emote brand connection, establish consistency and engage stakeholder involvement. Auction fundraisers should use branding too! Don Estridge High Tech Middle school is a great example of how they use branding for their Auction event all year long as well as year after year. Technology for Dragons has been the brand for over 7 years of auction. Their logo is very recognizable to all stakeholders: students, parents, teachers, employees. The logo and tagline have been used consistently on all communications regarding auction fundraising. Letters, newsletter, donation request letter, website, handouts, banners, and in general communications. Branding is important for long term development of a successful brand to achieve target fundraising goals. Don Estridge Technology Middle Technology for Dragons has mastered the branding and have shared some best practices with Auctria. Q. What does the group do and why? A. We support the technology needs of the students and teachers. We do this to insure the students have access to the current technology to advance learning. Our mission statement has evolved, but has basically been the same since our doors opened. It is proudly and permanently displayed in the facility and online. Their Mission statement includes: Don Estridge High Tech Middle School is committed to providing a world-class education... that includes a rigorous, technology infused curriculum to ensure that all students become responsible and productive lifelong learners. Q. What comes to mind when your brand is mentioned? How do you connect to donor emotions? A. We brand our students as “Dragons”. Technology for Dragons is the tagline used everyday on every piece of material. Public schools are typically underfunded and behind in technology. We use the data that show how students that immersed in technology early will be survivors and ahead of the game in life. Now is the time to teach kids how to use and think about technology, Now it the time to fund the technology, now is the time to teach and make technology a part of the every day classroom experience! Q. How do you get your message out? The logo and tagline have been used consistently on all communications regarding auction fundraising. Letters, newsletter, donation request letter, website, handouts, banners, and in general communications. Q. How do you get people to care? This is an evergreen effort. All year long we promote volunteerism opportunities, small and large. First we show what we have done in the past, then show what still is still outstanding to accomplish the goals. The gap hopefully provides a chance for parents, students, community partners to find any way to help. The obvious part is telling the public the purpose of the fundraiser. Use past success as future road map, data, anecdotes, pictures, videos to make a brand connections. Message on a regular basis through all channels consistently. Emails, social networks, make them all synetgistic. Include logo, cover photo, tagline sharing. Engage with shares to and from the auction site directly. Auction name, logo and tagline should be created to align with the group's mission. Use the auction, name, logo and tagline in every communications. 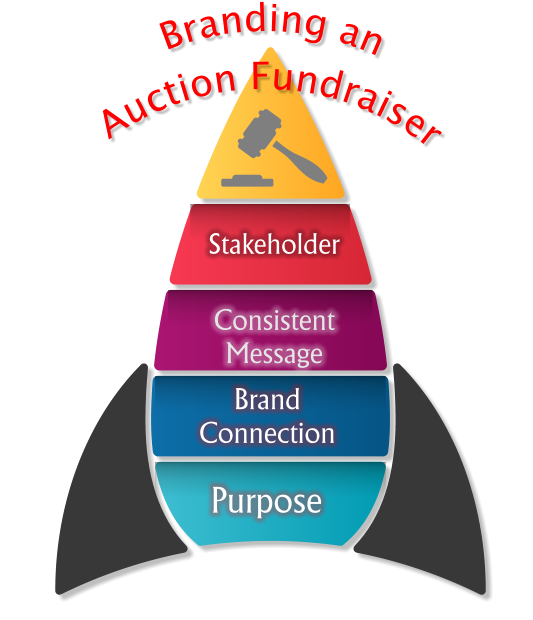 Use some of the insight from Don Estridge Dragons and make your next auction fundraiser a branded fundraiser.